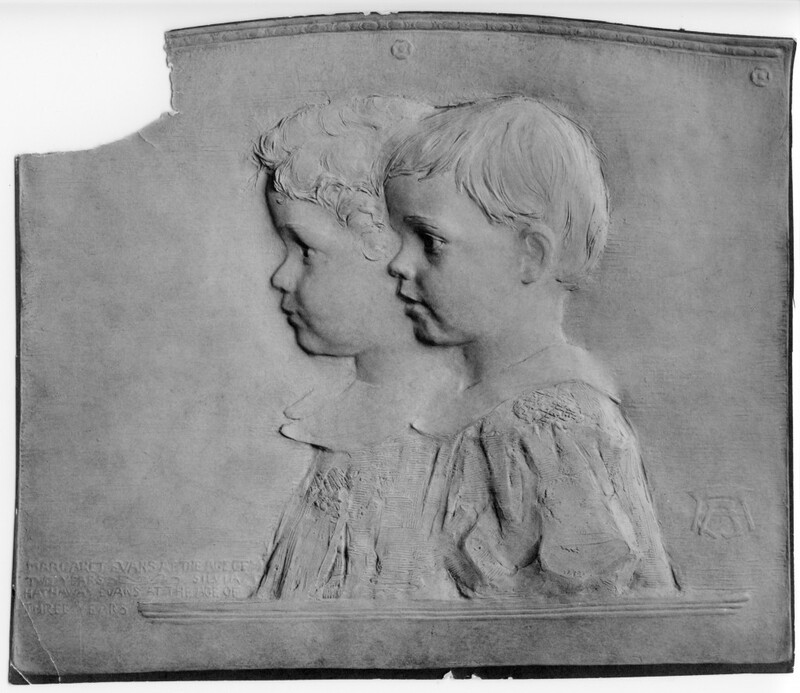 Silvia and Margaret Evans, granddaughters of Nathaniel Hathaway, double portrait relief modeled in 1919 by Frederick Warren Allen, Sculptor. Other family portraits were modeled at the same time. Nathaniel Hathaway of the prominent New Bedford family was the grandfather of these two beautiful children, Silvia and Margaret. Fred Allen had been invited to their Philadelphia home to visit and have photographs taken in preparation for modeling the family portraits. The home he visited in Germantown, PA was at one time a “safe house” for the Underground Railroad. Nathaniel’s grandparents were Quaker Abolitionists and active with at least one of the Evans family in Philadelphia in sheltering a slave girl, transporting her from Germantown to their home in New Bedford. At present count there are five portraits known to have been modeled of this family: Nathaniel, his wife Eliza, one of his daughters (unknown), daughter Susan’s little son Edward, and the portrait of Sylvia and Margaret, his granddaughters born of his other daughter, Sylvia. The double portrait is a very sensitive and beautiful depiction of these little girls. 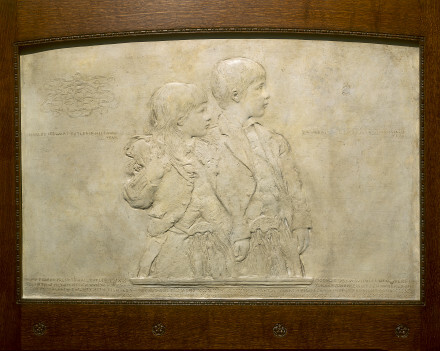 The children face toward the viewer’s left in profile. They are expressive and different from one another. Little Margaret is a chubby-cheeked and curly headed toddler with individual curls and wisps of hair showing in the details in front of her forehead. Silvia is older and slimmer in the face, her thin short hair lying flat with pointed strands around the forehead, her mouth parted as if about to speak. She has an expectant or attentive look. Her face covers the back half of Margaret’s head so that her ear is not visible, uniting the two portraits. There is high contrast in the shadows and highlights of the faces; high contrast in low relief takes skill to achieve. The dark lines of the profiles play distinctly against the lighter, smooth ground in front of them. Those lines also provide clarity in the separation of the two faces, yet the heads occupy the same space or volume. The necks blend together creating a single visual mass so that the two “volumes” won’t occupy the same space, a design principle Allen taught his students. The two dresses also blend together to form another single volume, heavily textured in contrast to the quieter treatment of the faces and collars above. There is rhythm top to bottom and side to side. Parallel faces, matching collars and textured torsos create the vertical rhythm anchored in the width of the bodies where they meet the shelf to which they are attached. Horizontal rhythm is established with 1) decorative edge, 2) smooth ground, 3) textured details of hair and faces, 4) smooth volume of necks and collars, 5) textured volume of dresses, inscription and symbol, 6) dividing and grounding base in the horizontal three-banded shelf, and 7) smooth ground below. The figures from the top of the head to the bottom of the shelf are centered between the upper and lower edges and although there is more space in front of the faces than behind the heads, the faces are the focus, centered side to side. The composition is simple and masterful. Both girls wear smocked dresses, details suggestive rather that realistic, with gathered dress bodices and smooth collars upturned at the points and lying flat on the back. There is a decided tactile nature to the garments. Silvia sports crisp, starched cotton puffy sleeves with a beaded appearance to the smocking under the collar, and Margaret’s dress clearly shows cross-hatched tooling that suggests a plaid fabric. They are “placed” on a three-tiered shelf that does not extend all the way across, the bodies ending above the waist on wide bases. The shape of the whole frame is rectangular with a gently arched top, decorated with a thin architectural patterned molding under a narrow rounded band that extends a little at the edges past the vertical borders into which they fade at the top, leaving the side edges with only a slightly raised line. There are three four-sided rosettes at the top center and corners, the triplet repeated in the molding of the base. The markings at the top under the molding are vertical and short with the suggestion of a pattern of rounded rectangles. The ground beneath is mostly smooth with some horizontal combing tool markings at the lower side edges and behind Silvia’s head and body with smoothed-out horizontal combings all across. St. Gaudens said that the ground is part of the composition. Here, the appearance of an etching in the ground treatment effectively unites the detail of the figures within the whole. This double portrait is clearly influenced by the St. Gaudens style. Compare to The Children of Prescott Hall Butler. There was great controversy in the late 1800’s about the subject of “finish.” Rodin would leave his carvings in this state, the figures or faces emerging from rough marble. In the days of Augustus St. Gaudens, the subject was hotly debated regarding the techniques he and other sculptors used in relief carving that were “sketchy” in appearance, more like paintings in clay. St. Gaudens argued passionately about his view that a piece of art need not be polished to be finished and that a sketchy appearance didn’t mean that the piece was incomplete. In his opinion, a work should be “judged on its character or effect, rather than on its degree of technical completion.” And that it “did not have to reach of point of belabored smoothness or detail to be worthy.” (Tolles) In that regard, look at the dresses of the Evans girls. They are freely modeled without regard for the details. The character of the children is more important, and here the point is clear: Allen’s compositional refinements here demonstrate his masterful touch. The inscription at the lower left above the “shelf” reads “Margaret Evans at the age of two years (scrolling lines) Silvia Hathaway Evans at the age of three years.” Note the spelling of Silvia. There is no signature or date visible in the photograph. A symbol at the lower right about level with the inscription looks like a Shinto temple over a square and compass or marker with a needle pointing down from the center like a scale. Underneath looks like a broken square for measuring. Mrs. Sylvia H. Evans is listed in his address book as “Evans Mrs Sylvia. Chees? + High Sts Germantown Pa.
Pan Birdbath, date unknown, c. 1960?